With ACTION constantly fine-tuning their timetables and often releasing small changes on Mondays, I figured one thread is best to keep it all together. Route 2 departing Woden at 7:38am, 7:53am and 8:38am - these services will depart between one and twelve minutes later along the route. Route 701 Afternoon service) Service departing Sydney Avenue at 4:42pm will depart between two and six minutes later from Civic onwards. There are a few school service changes for Term 4. There is likely to be a lot of school service change for Term 1 2010. Currently ACTION Supervisors are profiling every school route, they have around 30-40 to go. Apparently this sort of thing hasn't been doe for quite a while. So ACTION will easily alter a service to cater for some students, but nobody notices when students no longer catch the school route (moved on). This means a lot of pointless running, I know of some drivers who know where the students do & don't get off & just alter the route to cater for that. If you download the Intertown timetable, southbound 318/319 services have had a timetable change. But this update hasn't been listed on the ACTION timetable updates. That is because it is not an update, just a correction. And the HTML version of the timetable is still incorrect, despite me emailing ACTION about it several times (maybe I should try again). I haven't even seen this update on the ACTION Timetable Update page & I only found out after checking out what the piece of paper around the Fairbairn Park stops was. From Monday 21 December 2009, the 16:19 28 service will now leave at 16:29. No other timing point changes. Route 5 departing Woden at 6:17am Service will depart up to 9 minutes earlier along the route. Route 80 departing the City at 8:24am Service will depart up to 4 minutes later along the route. Hope this was publicised along the route, because it wasn't on the site until today - the day it took effect. Change to Route 939, Saturdays only, 10:46am service from the City only, will depart up to 10 minutes later along the route. There will be a slight change to the route ACTION Buses take through Brindabella Business Park, with more area now covered. The notice can be found at http://www.action.act.gov.au/recent_routes_change.html a pdf of the route can also be found here. The route directions for affected School Routes have been updated on ACT Bus. Changes to Brindabella Park Routes will be updated soon. Update 14/5 - Brindabella Routes have been updated. Hopefully when the new terminal opens up they might see the light and create a Inbound/Outbound stop route structure (Stops either side of the road), which would stop the 'Does this bus go to.....' when they don't read the destination. However, the Airliner is partly to blame with their desto's which do not clearly show its destination, instead opting for a scrolling Airport - CITY Airliner A1 etc which just confuses people. Passengers of the route 30 and 31 are advised that, due to an emergency incident on Ellenborough Avenue (between Daintree Cresent, Kaleen and the Barton Highway), services are now being diverted away from the area. The route 30 and 31 will divert via Baldwin Drive and Ginninderra Drive before resuming normal running. The route 6 is not affected. Due to these diversions, services may be delayed and therefore passengers should allow for additional time to get to their destination. These diversions are expected to remain in place for several hours. ACTION thanks passengers for their patience. Please contact ACTION on 13 17 10 for further information. Mistake "Ellenborough Avenue" its not an avenue the correct name is Ellenborough Street. If only they had a twitter account to relay that type of information. Same thing was done for the Northbourne Avenue closure for a recent murder in Braddon. 8:54pm Monday 29 August 2011 - Update four on gas leak at Kaleen. Gas leak has been isolated. Repairs are continuing with ACT Fire Brigade crews due to depart by 10pm. The new map is now on the ACTION website, even an updated weekend network map is uploaded. As of today, only Routes 3,4,5,7 & City West terminating routes use the northbound stop on Alinga Street. All other services use the new stop on Marcus Clarke Street. The temporary stop on Marcus Clarke Street has also been closed. And 934 from Saturday - so long as drivers remember that the route has changed. I think there are some Xpressos and 200 Links which still use the Alinga St stop as well. In fact, any service which turns LEFT into Marcus Clarke from Alinga will continue to service the Alinga St stop. Been a while since there were any changes: effective Monday 3 February, Route 11 which previously departed Woden at 16:40 will now depart at 16:43. And that's all. New Google Transit feed file is available. They were putting new weekend timetables up at Westfield last night. Unsure what the changes were. Can't find any recent weekend changes. I think they were for last year's revised 958 timetable. Interesting. The PDF timetable indicates that it terminates at the Sydney Building. The HTML timetable says it continues to London/Akuna, but uses a Melbourne Building timing point beforehand - there's no stop at the Melbourne Building, though! Quote The Tourist Loop Route 81/981 will change route direction as a result of the reopening of Constitution Avenue. Route 81/981 will travel from ANZAC Parade then right onto Constitution Avenue, left onto London Circuit and then onto Commonwealth Avenue. This change will also allow the route to service the National Convention Centre. The timetable will not be affected by this service change. New PDF files available at the above link. You still can, catch a Blue Rapid to "ANU Barry Dr" & walk 3.6k's to the peak. Or walk 2.5k's from the Botanical Gardens stop. Hope this is the right place to ask this, anyway though. I didn't know that the multicultural festival was on (cause I didn't read the latest email alert until just now), so when the 300 to the City that I caught yesterday took the alternate detour, that's when I realized. It got me thinking about something though, because the 300s aren't suppose to or are required to not stop at the west side bus stops whilst taking the detour, why do they go that way then? Cause the southbound routes exit the interchange taking a right, then go left onto Vernon Circle, and continue on with the route - nice and easy and quick. But the northbound take the full other London Circuit trip, and cause they don't stop why can't they just change lanes after bus 8889, and go around Vernon Circle the other way - at least if they go that way, they would only need to wait at the London Circuit/Northbourne Ave intersection, whereas going the west detour passes through an extra set of lights + the Northbourne crossing lights don't last as long as the North/South sides, which means they're having to wait longer esp during peak. Can someone clear this up for me please, cause it just doesn't seem all that logical to me. Or if you think that this would be a good suggestion for ACTION to use, I will do so. Northbound services travel via London Cct West instead of Vernon Circle because to turn right onto London Cct after Vernon Circle is painful because you can only get one bus through each light cycle (because when you get the first green light, you turn onto London Cct and get stuck at the Northbourne Ave/London Cct southbound lights and yeah...). London Cct West does not have this same issue as you can get a number of buses through each cycle. Southbound services also don't have this issue. I was actually on a northbound 900 today that tried using Vernon Circle - it was beaten to the City Bus Station by the following two 900 services (which left Woden up to five minutes after this service!) because of the delay. Ok yeah, I suppose that makes sense. Route 200 Red Rapid - Use of rear bus door. Perhaps I have missed a forum reference to this but I can't find any, so here goes. Commencing Monday 13th Feb 2017 customers will be able to exit the bus using both front and rear doors on all Red Rapid services at all stops, as part of a one month trial. Customers are encouraged to use the rear door to exit so as to speed boarding up and so reduce dwell time. Boarding through the rear door for MyWay patrons is allowed at Gungahlin, Civic, Barton and Canberra Outlet Centre. Quite a development. 'As part of a one month trial', so what is the rest of the trial? Presumably the month is up, but the notice is still displayed. It will be interesting what the trial outcome will deliver. In the end, I don't thinks its particularly significant. From comments made on TC Facebook, many drivers were not opening rear doors for boarding during the trial period at those locations. I don't think many passengers were aware of the trial despite how many ways action tried to get the word out. On the other hand, I have seen drivers allow for rear door boarding at other stops such as Narrabundah College on route 4/5. Reference Canberra Times, today, pages 8-9, item 'Denman Shopping Precinct Aired'. That has been mentioned. It will happen. The only question is when? October? December? Next year? Services to Denman Prospect are to commence with the next network (as mentioned in the "Network the Next" thread and quoted below). In my boredom last night I came across this video where TCCS director gives a presentation about Public Transport in the Molonglo Valley. It mentions that the next network (whenever that may be) will feature an extension to the 182 to serve Denman Prospect. The route seems to take a one way loop from John Gorton Dr onto Coaldrake Ave, Bielski St and Wyndham Ave, before returning to John Gorton Dr. To be honest that could easily be added now given the timing on the 182 being quite loose. The roads in the section of Denman Prospect where the shopping precinct is to be built are not yet complete and buses will not likely service that area of the suburb until late next year around when the shopping centre is due to open. 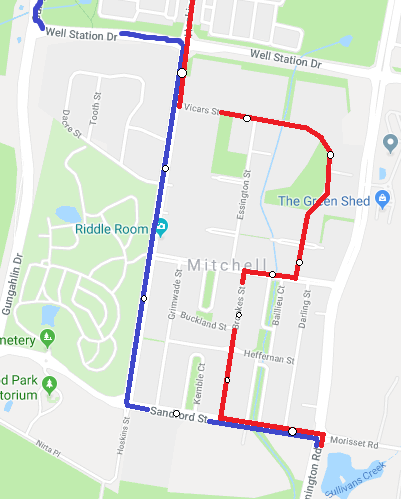 If the fact that Mitchell isn't getting a lightrail stop wasn't bad enough, just trying to get around on foot in Mitchell is hell as it is. After carrying a rather heavy and very awkward container, my arm was in a lot of pain (and still is) after walking pretty much the distance of the perimeter of the industrial part of Mitchell cause of getting lost and going back on myself when I approached the lightrail crap which is inaccessible due to the restriction of pedestrian access in the area, when there's so many stops that could used, people like myself wouldn't have to go through such bull. I've been working on a modified network design like the rest of you have shown in the past, and one such improvement that I would make I will share now just to show what I believe should be done, and even with this change, it would only affect the routes by 2-3 minutes, replacing 1 stop with 6. Note: The placements of the stops are off a little cause I was tired drawing this up and don't really know the area fully (although checked google maps later for the remaining stops on Vicars street I didn't see). I have noticed that route 60/160 is very frequent for a short period during the afternoon; there are two southbound services departing Woden Bus Station within the space of five minutes. These two services are at 6:03pm and 6:08pm; the first trip is a 60 commencing at Woden Bus Station, the following is a 160 commencing from City West Bus Station at 5:45pm. I am proposing that in the new network, that whilst I am aware that the route will start at Woden Bus Station, the 6:03pm should be removed; the 6:08pm trip should be increased to an articulated bus, this will help meet capacity requirements. That is just the tip of the iceberg of the horrific planning that went into the timings of the past few networks. If you ever ride those buses regularly you'd notice that one bus will pretty much always be empty and the other sometimes full - and that's not just for these two routes. Even if the 60 were removed, I still don't feel it would need an artic, maybe a higher capacity bus like a 2, 3 or a Volgren, cause like most of the routes like it, most of the patronage is 300 users going between the City and Woden. Although not quite as often, but pretty frequent at that time of the afternoon are the 62/162s. I've been getting the alter-ego of that 160 (162) and it gets maybe 10 people on it at any one time on any day. Most of the patronage is for Kambah, and not 300 users mostly probably due to the fact the the 160 picked them all up as there's only like 6 minutes between both of them leaving City West. Have noticed that the route 163 has a lot of trips that are not marked as wheelchair accessible. Through the morning, 7/8 trips are non-wheelchair accessible and in the evening, 5/8 trips are non-wheelchair accessible. Needless to say, this is bad scheduling that affects anyone with bad physical mobility. It's the same with the 171.